Alfa Romeo Mito Multiair driven | What Car? Alfa Romeo might not be looking to save the planet, but its new Multiair engines certainly represent a significant step in providing cleaner air for all. With a claimed reduction of up to 10% in fuel consumption and CO2 emissions, and NOx outputs slashed by as much as 60% over a conventional petrol's, the Multiair engines look like being sure-fire winners. Instead of using a conventional camshaft, a series of oil-fed solenoids, which can be infinitely varied, precisely meter out the exact fuel requirements of the engine at any given revs. This greatly benefits fuel efficiency, but it also boosts power and torque, and throttle response. In practice, this means you can take off in an abnormally high gear and the engine will still pull smoothly from next to no revs, with none of the judder you'd expect from a traditional engine. 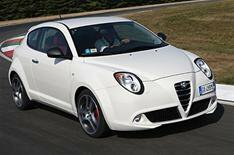 Along with an engine stop-start system, Alfa is launching three Multiair units in the Mito. All are 1.4-litre, four-cylinder units: an entry-level one with 104bhp, plus 133bhp and 168bhp turbocharged versions. What's more, stung by criticism of the Mito's so-so dynamics, Alfa has recalibrated the steering and suspension settings, plus there'll be a 168bhp Cloverleaf version with automatically adjusting shock absorbers and bespoke steering settings. We tested the car on a smooth Italian test track and, although the Mito feels more agile than previous versions, we'll reserve final judgment about the ride until the car pitches up in the UK. Early impressions, however, suggest that Alfa could soon be inhaling the sweet smell of success.